Dave Prowse & Ian McDiarmid signed 16"x20" Metallic Photo. Dave inscribed "Darth Vader" & Ian inscribed "Emperor". This item has been fully examined by James Spence Authentication (JSA) and comes with a Full Letter of Authenticity. Dave Prowse signed 16"x20"x1.5" Stretched and Mounted Official Licensed Canvas. Dave inscribed "Darth Vader". This item has been fully examined by James Spence Authentication (JSA). Dave Prowse signed 24"x36" Full Size Poster Star Wars. 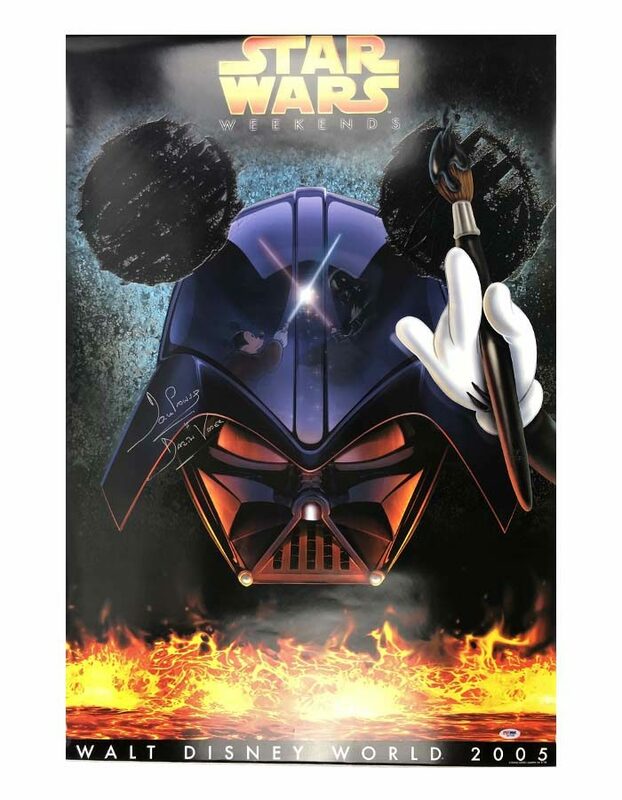 This is the official 2005 Disney Star Wars Weekends Poster! It was a limited released item and was sold out by the second weekend back in 2005! This item has been fully examined by PSA/DNA. Rian Johnson signed Baseball Star Wars. Rian directed the Star Wars "The Last Jedi. This item has been fully examined by Beckett Authentication Services. STAR WARS EMPIRE STRIKES BACK 24×36 Poster Cast signed by MARK HAMILL, DAVE PROWSE , PETER MAYHEW, BILLY DEE WILLIAMS, ANTHONY DANIELS, JEREMY BULLOCH, & CLIVE REVILL. STAR WARS EMPIRE STRIKES BACK 24"x36" Poster Cast signed and inscribed by MARK HAMILL "Luke", DAVID PROWSE "Darth Vader", PETER MAYHEW "Chewbacca", BILLY DEE WILLIAMS "Lando", ANTHONY DANIELS "C-3PO", JEREMY BULLOCH "Boba Fett", & CLIVE REVILL "Emperor Palpatine"! This item has been been fully examined by Beckett and comes with a Full Letter of Authenticity (LOA). STAR WARS: GALAXY 36"x24" Cast Poster signed and inscribed by MARK HAMILL "Luke", DAVID PROWSE "Darth Vader", PETER MAYHEW "Chewbacca", BILLY DEE WILLIAMS "Lando", ANTHONY DANIELS "C-3PO", JEREMY BULLOCH "Boba Fett", CLIVE REVILL "Emperor Palpatine", IAN McDIARMID "Senator, Chancellor, Emperor", David Barclay "Jabba The Hutt", TIM ROSE ("It's A Trap! ", Admiral Ackbar, Salacious Crumb, Sy Snootles), PAUL BLAKE "Greedo", WARWICK DAVIS "Wickett", MIKE QUINN "Nien Numb". This item has been been fully examined by Beckett and comes with a Full Letter of Authenticity (LOA). Warwick Davis signed 11"x14" Photo. This item has been fully examined by James Spence Authentication (JSA).